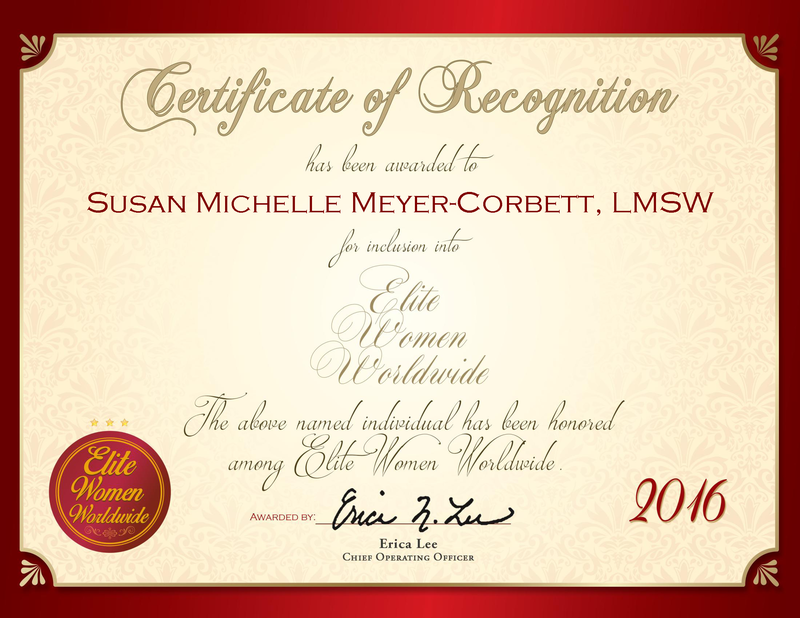 Port Jefferson Station, NY, April 28, 2016, Susan Michelle Meyer-Corbett, Holistic Counselor, has been recognized by Elite Women Worldwide, for dedication, achievement and leadership in health and wellness services. Ms. Meyer-Corbett has been an active holistic counselor for the past 13 years, transforming people’s lives with reiki, angel therapy, and other homeopathic methods. In addition, she is an instructor of these methods. Ms. Meyer-Corbett also sells aromatherapy products, environmentally safe products, boutique sauces, and flavored oils and spice rubs. In the years to come, she hopes to establish a wellness center that integrates medical healing with alternative healing, she hopes to branch out these centers to every community. On top of being a Reiki Master, she is certified in aromatherapy from the Michael Scholes School for Aromatic Studies and is a licensed social worker. She received a bachelor’s degree in English and communications from Hunter College, and a Master of Social Work from Stony Brook University. She holds workshops that combine art, poetry therapy, dinner and wine. She also consults on healing and aromatherapy each week at the Cornercopia Café in her town. In addition, she teaches yoga and is a representative for Primerica Financial Services.